My learn to swim journey began in All Saints School with Glasgow City Council. I then swam at the Glasgow School of Sport at Bellahouston Academy & City of Glasgow Swim Team as a developing age grouper after beginning my club journey at Scotia, in Bishopbriggs. Going on to have a professional career; travelling around the world, competing & winning medals at every level of international competition was incredible & I feel very lucky and grateful to be launching our own Swim Academy, it really is ‘ours’. I’ve always had an incredible amount of support from the people of Glasgow & this is a fantastic opportunity for me, along with an amazing team, to pour knowledge & resource into making a positive change in developing astute young athletes. I progressed through the learn to swim framework in Glasgow, I was schooled in Glasgow, progressed & developed my swimming to professional level all before leaving my home city. I feel very strongly that being a product of the system gives me an amazing opportunity to improve & enhance the learning of the young swimmers here in Glasgow. Now, having transitioned out of competitive sport, I can pinpoint key areas in my swimming journey that helped me progress & excel. I’m extremely passionate about providing a real learning platform to develop curious, self-aware, responsible young people through the sport of swimming. Thanks for all your support throughout my competitive career & it’s valued now more than ever as we work together, as a team, to improve how young people develop multi-faceted skills through sport! Thank you! I have worked in the swim industry for almost 20 years and I have never loved it more! I am exceptionally passionate about having a positive impact on the standards within learn to swim, and ensuring that each and every learners journey is the best that it can be. 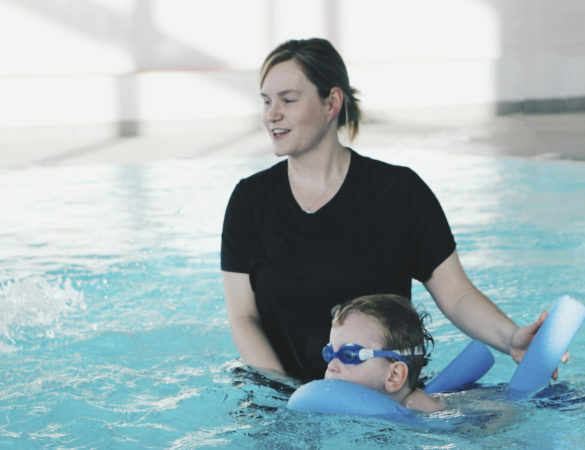 I have taught at every level over the past 18 years as a fully qualified swim instructor, gaining my professional qualifications across both national and international governing bodies of sport. I have worked extensively in both the public and private sectors teaching everything from baby and preschool to coaching triathletes in the open water, developing their skills in preparation for their first Ironman event! I aim to provide the highest of standards regardless of age or ability through the advocation of a swimmer led experience of self-discovery and awareness. Throughout the years I have been responsible for designing and developing many swim programs across the UK as well as delivering training and mentoring the next generation of swim instructors and program managers. At ‘MJSA’ I will mentor every member of the teaching team to ensure that teaching methods stay current and relevant in order to provide the highest quality of lessons for you and your child. My main aim at the academy is to enable everyone involved to achieve their full potential. From every child/adult building their confidence in the water to every budding triathlete preparing to compete in open water for the first time. My dedication to providing the best learning and training environment can be seen in everything I have contributed towards to date, and will be evident in everything we achieve as MJSA in the future. All of our instructors are fully qualified level 2 aquatic teachers (at minimum), with many of them achieving additional specialised qualifications and experience. They have the knowledge, skills, expertise and drive to ensure you get the most out of your lessons. Each instructor is hand picked by Olympic medalist Michael Jamieson for their passion for swimming and dedication to your journey.